photo-eye Gallery Humble Observations: Mitch Dobrowner Interviewed by Anne Kelly Gallery Director Anne Kelly interviews Mitch Dobrowner about the process and intention behind his work. Dobrowner's exhibition Tempest is currently on view at photo-eye Gallery through November 11th, 2017. 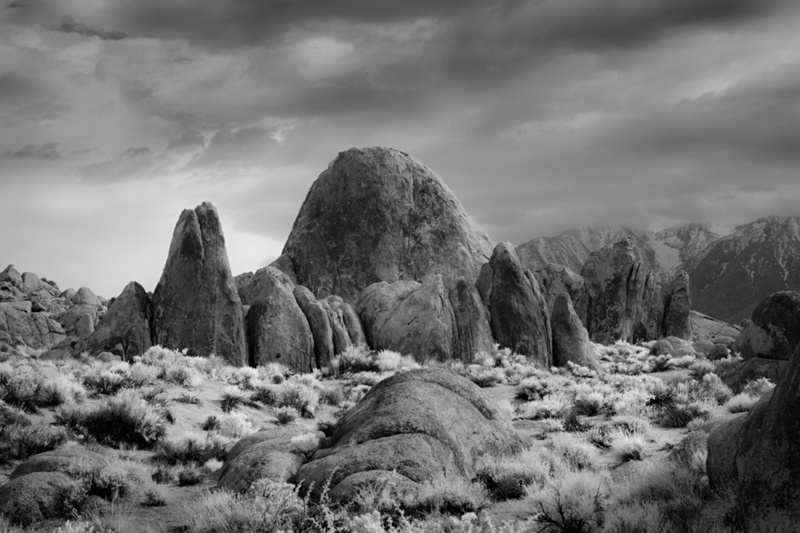 I am honored to say that I have been working with Mitch Dobrowner as a gallerist for about a decade now, and I am inspired by Mitch not only because of the astonishing images he creates but also because of his genuine character. 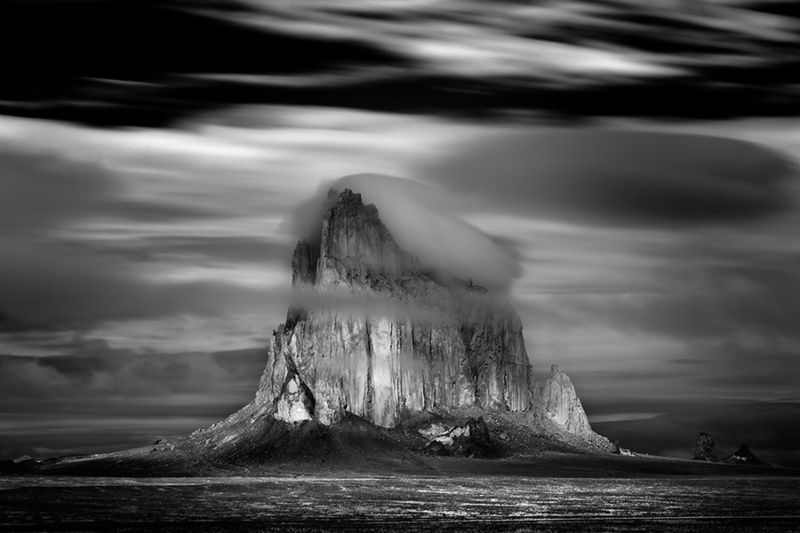 Dobrowner doesn't make photographs for monetary gain or celebrity status, but out of a desire to record images of the landscape not just as he sees it — but how he feels about it. Equipped with his camera, which he considers his paintbrush, Mitch's artistic approach is patient and reverent. Sometimes he works methodically, visiting locations that are remote, cold, wet, windy and without the comforts of civilization spending days and even weeks respectfully waiting for a specific light or the right clouds to click the shutter. 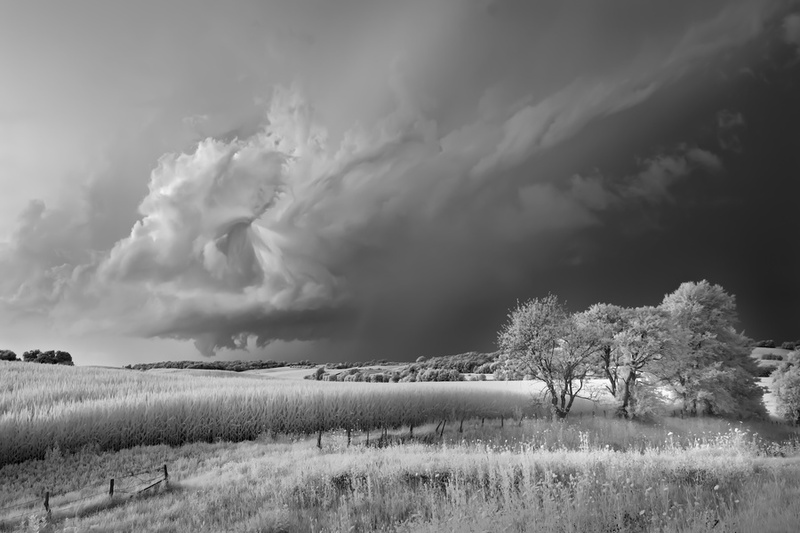 Other times Dobrowner must work quickly responding to an ever-changing sky as he travels in the company of veteran storm chaser Roger Hill to track down the unique mixture of elements in the environment that result in epic storms. In my opinion, “landscape" is a challenging subject because the genre is so well explored throughout Art History. 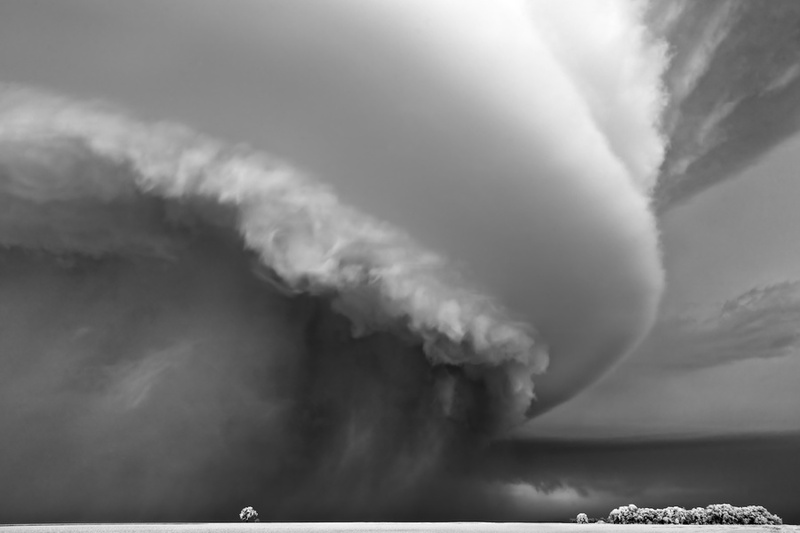 Due to his unique vision, approach, and tenacity, Mitch Dobrowner makes a substantial mark in a very crowded field. 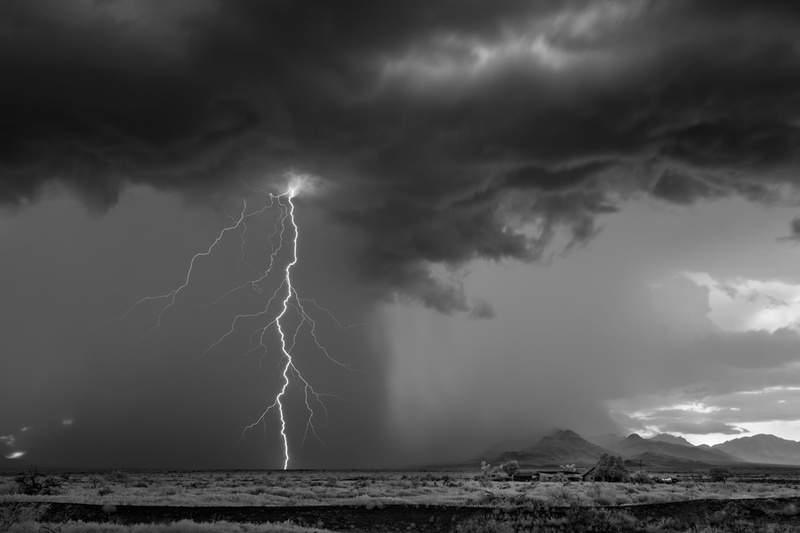 In honor of Tempest, Dobrowner’s third exhibition at photo-eye Gallery and currently on view through Nov. 11th, I wanted to share some of my recent conversation with Mitch about his work. Anne Kelly: It is not uncommon for viewers of your storm images to address the potential dangers involved with storm chasing or to make note of your bravery. Of course, this year more than ever we know storms can be dangerous and destructive but is this really what your work is about? 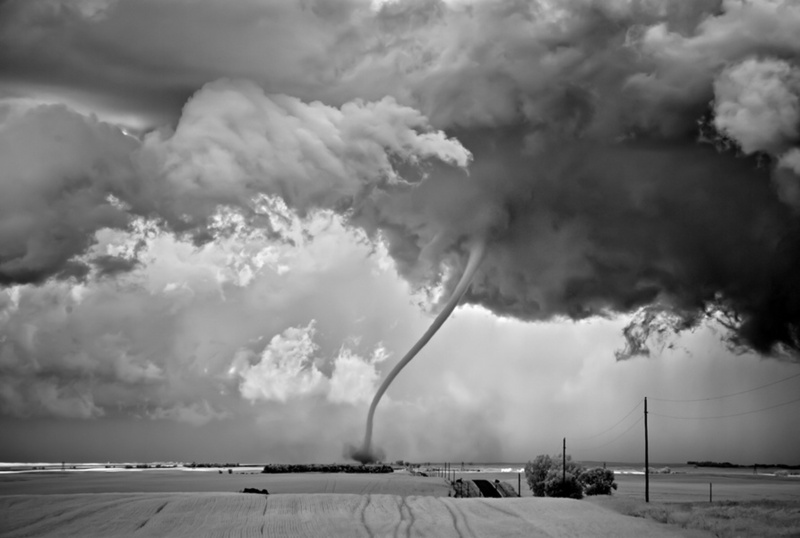 Mitch Dobrowner: I think this is an important question, only because I'd like to change that narrative a bit. I don't think making a spectacle of what it takes to create the images is important. What's important are the images themselves. Photography is my personal artform and the images speak more about me and the subject matter than I can ever describe in words. The pictures truly do evoke what I feel on the inside about our planet. The storms and landscapes here on earth deserve our respect and admiration. This is what I feel as I stand in front of them; their stature and prominence overwhelm and amaze me. I'm just trying to capture them in a manner that does justice to them. Telling the story about how they were captured as "dramatic and scary" can de-emphasize what the images are really about. I know people want to hear how dangerous it can be but the truth is, this is something that I love doing. The images themselves evoke what I'm trying to say. The quality I'm trying to achieve with my prints is what's most important to me. My prints are my true interpretation of what I feel. The JPGs files people view on their computer screens, tablets or phones are only proxies of my vision and interpretation. The truth is that the only thing that scares me when I'm out photographing is either: (1) seeing a mouse in the fields or (2) running into a skunk either while hiking or in my tent when I'm camping. Rodents scare the hell out of me. So when people want to promote the drama and 'scary' aspects about the work I feel it can turn the work away from its true meaning and devalue it as my art. I know it's not intentional but it can have a subliminal effect. AK: You list Ansel Adams and Minor White as influences. In what way did these keystone photographers influence your work? MD: The first time I picked up a camera at 17 I quickly became addicted. As I was searching for who I was and what photography was all about, I eventually stumbled onto the images of Minor White and Ansel Adams. I had never been exposed to photographic images such as theirs before. Their images were mind-boggling to me. To me, Ansel was all about light, composition, making order out of disorder, being in touch with the environment while addressing all the technical aspects of photography. Ansel’s books The Camera, The Print and The Negative quickly became my bibles. There will never be another Ansel Adams. When I first saw Minor White's images they were all about using light and shadow in compositions. I became infused with his images and because of that began experimenting with surreal abstract forms and closely watching how light would move across an environment. This lead to a job in film sensitometry as I wanted to know everything I could about film and not be intimidated by it, and that eventually led to work as a freelance assistant to photographers Pete Turner and Hashi in New York City. These experiences and the experience of working with 4×5 and 8×10 cameras, cold light printers, the wet darkroom producing silver prints, IR films and various development techniques with color films were invaluable to me, and are still the foundation of my work today. AK: Is your work also influenced by artists working in other mediums? As I mentioned in our recent Gallery Favorites post some of your images remind me of the sublime paintings of William Turner. MD: I've always been in love with the work of Georgia O'Keeffe. Her work is indescribable. Also when I was a teen on Long Island I would travel into NYC every chance I could to visit the Museum of Modern Art. There I would sit alone in front of the paintings of Picasso and Miro for hours. I loved quietly looking at them and letting them overwhelm me. Music has always had a major place in my life too, all types of music. Art and music have been a part of mankind since its earliest days for a reason. Mitch Dobrowner filming on location. 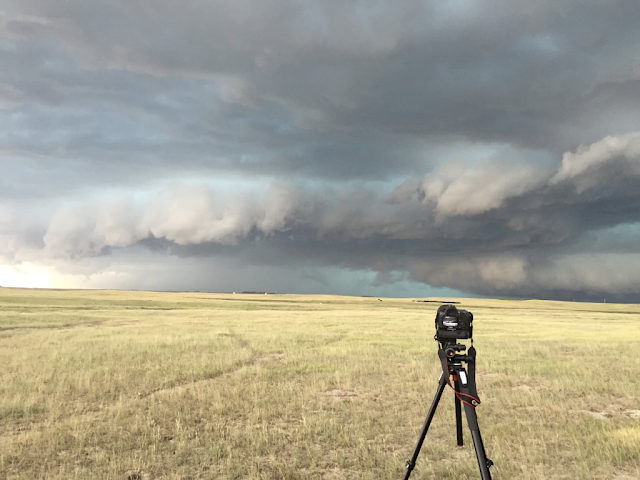 60,000-foot high mesocyclone and that one of the major challenges you faced while photographing was simply comprehending what you were witnessing. So, there was an adjustment period. How are you now capable of recording your storm images in the same Zen state that your Still Earth landscapes come from? MD: Yes, photographing storms has helped me improve as a photographer and as a person.... as it has taught me how to better quiet my mind and concentrate. When I'm out photographing in the southwest desert there is a major physical toll that it takes on me; being out in the environment for extended periods of time, hiking, camping and lack of sleep. But the biggest challenge has always been clearing my mind from the daily deluge of information and "life" that always gets in the way of me "seeing". It usually takes me a few days before I can even pick up my cameras. As my mind clears and I get in touch with the subject that I'm to shoot (be it storms or desert landscapes). I'd explain it like being outside in the bright sunlight and then walking into a dark room. The moment you enter the room you can't "see" anything, but as your eyes adjust you begin to "see" again. That ability to "see" is the most important aspect of photography to me, everything else is secondary. I know I'm ready to start to photograph again once my mind has cleared, as it's only then that I feel grounded and can finally hear my heart beating again. With storms, it's about getting to that "happy place" and then exercising my focus. You never really know beforehand what the environment, atmospheric conditions, circumstances or particulars of a storm are going to be until you step out of the van. Each storm is different, the environment it's in is different, the light is different...compositions are constantly changing. The noise, the winds, the people around you are other aspects that can easily break your concentration. So over the years, I've learned how to get into a Zen state when photographing. All I listen to is my friend Roger's voice saying "we have to get out of here, now!!". This state of being has helped me grow as both a person and a photographer. Hey, maybe all this training will lead to my next chapter in life as a war/documentary photographer..... who knows? Mitch Dobrowner's camera set up on location. AK: Ok, so everyone wants to know about the technical side of your work –lets talk about the gear. MD: Sure. My main technical pieces of gear are my heart, my eyes, and my soul. Everything else is my second tier of gear. The images come from within – they reflect what's inside of you. Though the hardware like cameras, tripods, and lenses, are important pieces of the total puzzle, they are not my primary focus. The images represent the state of mind that I'm in at the time I click the shutter. I know this may sound a bit cliché but it's my truth. If I am not in the right place when I'm shooting I'm wasting my time. I know because I've wasted a lot of time in the past. My cameras are there to only act as an extension of my eyes and hands. My camera is my paintbrush – I am just painting with light instead of oil, acrylic or watercolor. One of my cameras is modified for capturing UV-VIS-IR light waves, 300 to 1100nm+ of light waves, and lets me filter light in the same manner that I used when I shot with black and white film. I'm bending light in the manner that allows me to interpret the scene in black and white, in my own way. In a technical sense, it also allows me to create my own digital interpretation of Ansel Adam's Zone System. This methodology came to pass during my migration from film to digital. I first needed to spend time understanding every aspect of a digital camera I could, its sensor, bayer pattern, IR blocking filters and lenses. So that once I was out photographing, the camera was not something that I thought about but instead acted as an extension of my eyes and hands. It's similar to the way a great guitarist wouldn't be thinking about his guitar during a performance... the hours of practice allowed him/her to focus on playing, not on the guitar itself. The same goes for the printing process. I have always loved printing. I've spent thousands of hours experimenting, taking printers apart, understanding printer heads, the various papers, inks, RIPs and the best manner for grading images in Photoshop, in the quest to push the quality of my prints that extra 2%. The entire photographic process excites me as it has allowed me a venue to illustrate my individual way of seeing the world. The time taken to understand my equipment, decide what subject matter I was most interested in, traveling, shooting, seeing an image for the first time on my computer screen, grading that image, and producing a print. That entire journey is what the art of photography is all about to me. And all the people that I met through photography has been life-changing. All told, I feel very very fortunate to have people react to my work - it's extremely humbling and exhilarating at the same time. It also chokes me up most days as it's like a dream come true. MD: Photography inspires me to continue to advance and improve as both a person and an artist. The changes in our society and its outlook towards today's art and contemporary artists... the effect that all the imagery and information accessible to us can be overwhelming. But ART represents a quiet place, a place that can inspire and allow people to get back in touch with themselves and their priorities. Art has an intrinsic value and as with music, is a staple and foundational piece of society that has been a part of us since the beginning of mankind. It's important that art continues to evolve and inspire; I feel honored and very fortunate to even be classified as an artist today. Tempest is on view at photo-eye Gallery through November 11th, 2017. For more information and to purchase prints please contact Gallery Staff at 505-988-5152 x202, or gallery@photoeye.com.